Andy VanSlyke Autograph On VanSlyke Silk. Postmarked July 12, 1988, Cincinnati, OH – 1988 All-Star Game. Three Different Designs: (Scott Forst All-Star Artpiece, American League Player (Terry Steinbach) And National League Player (Andy Van Slyke). 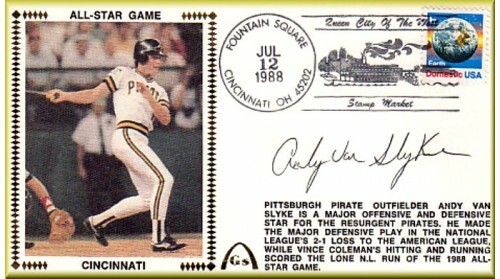 The Artpiece Envelopes Were Printed With Game Information, National League Envelopes Tell The Story Of The Main Players, Including ($40) Andy Van Slyke & American League Envelopes Tell The Story Of The Main Players, Including ($40) MVP Terry Steinbach, ($75) Steinbach/ Gooden Combo. Riverfront Stadium Art Signed: ($50) Wil Clark or Paul Molitor: ($40), Dwight Gooden: There Are No Unautographed Envelopes Left On This Set. Only 635 Envelopes Were Created (Very few left).